The church prefigured. Here Christ has prefigured the Christians life, especially the Gospel ministry. The ship signifies Christianity, the sea signifies the world, and the wind signifies the devil; his disciples are the preachers and pious Christians; Christ is the truth, the gospel and the faith. 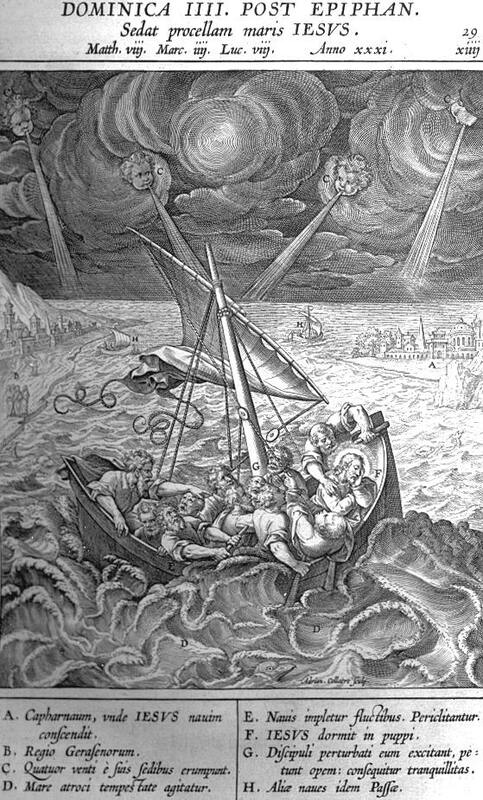 Now, before Christ steps into the ship with his disciples, the sea and the wind are calm; but when he enters with his disciples, then the storm breaks loose. See Matthew 10:34-36. The world can endure all kinds of preaching except the gospel of Christ. The devil rouses up the winds; that is, his lying spirits, her esies and sectarians. And although they are divided among themselves and oppose each other, one wind blowing hither, and the other thither, and the waves tumbling over each other; yet they all unitedly strive to overwhelm the ship of Christ, although they have no cause against him. For he carries on no strife or disturbance, but sits still in his little ship, yea, is even sleeping. But this might now be regarded as a great misfortune, that Christ in the midst of this peril of death rests and “sleeps” a real, natural, profound sleep. But this sleep must be service able to his disciples for the strength ening of their faith, as all his works are. This occurs yet at the present day; that the Lord in times of persecutions withdraws from his Christians, and acts towards them as though he did not see us; yea, as though he had entirely forgotten us, as though he were asleep, and afforded us no strength, nor power, nor peace, nor rest. Then in our weakness he permits us to be in anxiety and to labor, in order that we may realize our entire nothingness, and that everything depends on his grace and power. But this is the devil’s manner; when he attacks the Christians, he does it just at that place and time where and when they are weakest, and where he can most easily frighten them; just as here also, the fact that Christ sleeps shows the state of their hearts; namely, that their faith was weak, sleepy. We perish. When the storm comes and the waves roll over the ship, then faith is gone, and the calmness and the peace, to which they clung, have passed away; therefore they drift along and nothing is left them but unbelief. This unbelief sees no more than it feels; life and security it does not feel; but it feels the waves dashing over the ship, and the death-threatening sea, and every kind of danger. Yet, whilst a weak faith still remains, as Christ himself testifies (v. 26,) they have a remedy, so that they do not entirely despair, and they run to Christ. If their faith had been firm and strong, they could have said to the wind and the waves, beat on, but ye shall not be so strong that ye can overturn the ship, because we have the Lord Christ with us. He can protect us, not only on the sea, but also in and under the sea. That is a right kind of faith, which, while in the very jaws of death, takes courage and clings to this consolation, that help is near. Therefore faith is not a small art or thing; it is a divine power, which does not come from our own free will, but is given through the word by the Holy Ghost. Although Christ could prevent and stop the devil’s rage and fury without our crying and weeping, yet he will be waked up and called by us (Romans 8:26) that we may learn that his power is mighty and invincible in our weakness. What manner of man is this! 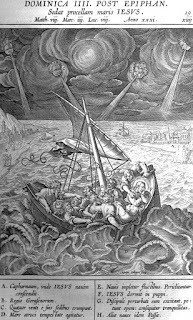 When Christ appears so very weak and (as it seems) ignorant and so powerless, and the devil comes so near to him, and already snaps at him, as though he would devour his Church; then Christ must wake up, and let himself be heard and seen, and not let the devil sink his little ship, and drown him, as he intended. This miracle should be the more acceptable to us, since we see how God and man are one person in Christ. It is useful and comforting for a Christian to see how this faith and preaching, and this same power and might of the Son of God have at all times been maintained in the Church. For as many as have antagonized the Church and have raged against it have perished, thank God; for example, Babylon, Assyria, Rome, the Turks. Luther’s Explanatory Notes on the Gospels, pp. 51-52.